Did you know you can substitute avocado for butter? Sure, avocados still have calories and fat, but the fats are much better than in butter or oil. Did you know avocado is a fruit? To be honest, I do not like avocado that much by itself (tastes quite oily and fatty>.<), but using the creamy texture of avocados instead of using the cream or butter or oil is fantastic. While avocados still contain calories and fat, they’re also packed with powerful nutrients. Avocados contain high amounts of monounsaturated fat which is easily burned for energy. They are also high in fiber (10g per on average avocado), potassium (twice the amount of a typical banana), Vitamins E and B and folic acid. They have been shown to reduce cholesterol and help manage weight. Add all ingredients in food processor and blend until smooth. Make the truffle balls. If the mixture is too wet to work with, add a little bit more coconut flour. Roll the truffles on carob powder. Store in air-tight container in the fridge. Blend all ingredients in food processor. 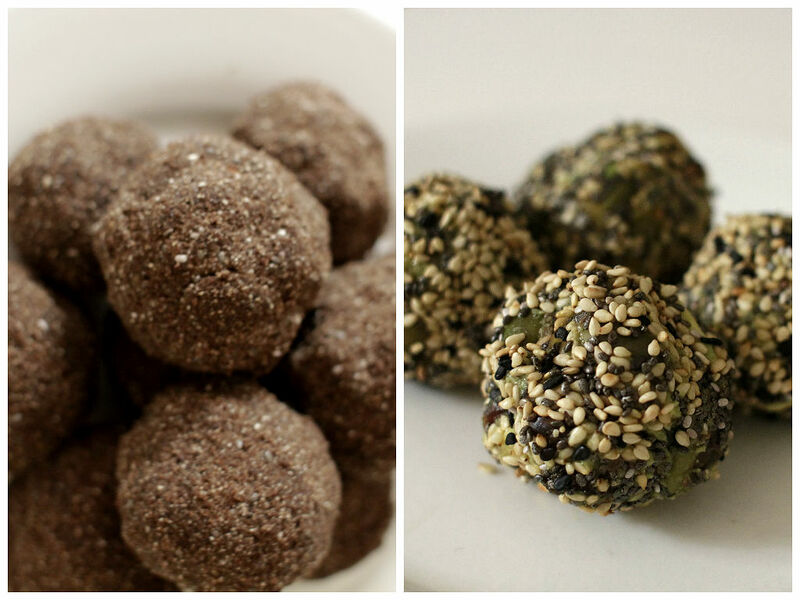 Make the truffle balls and roll on chia seeds and sesame seeds.